Thomas Baker Leamington (1809-1864) was primarily a landscape painter in oil and watercolour who exhibited at the Royal Academy in London from 1831 to 1858 and in Birmingham between 1827 and 1873. 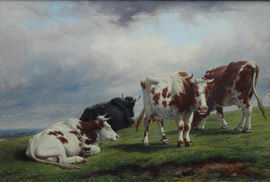 He lived in Leamington in the years 1854 to 1862 and many of his landscapes, including those with cattle, are from the area. He was the best known and probably the most accomplished painter of the numerous Baker family of artists.